Tim McCarthy talked to ThinkAdvisor about being president of Schwab and Fidelity, revamping struggling Asian firms and the good things Bernie Madoff did. Cover of Tim McCarthy's new book, due out on Feb. 4. Even people with great reputations, he says, can commit fraud. McCarthy, 62, speaks from firsthand experience: He did business with Bernie Madoff. But he wasn’t a victim. Initially, he was an admiring colleague of Madoff; some years later he had cause to be skeptical, if not suspicious, of him. 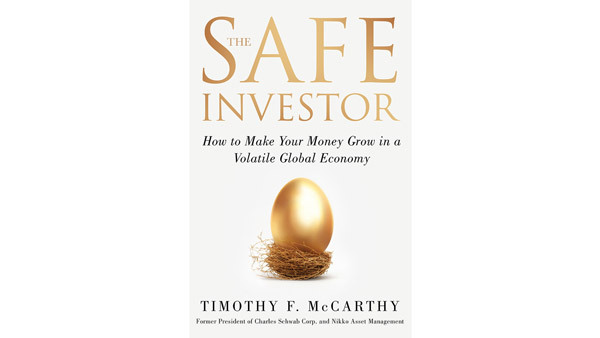 After eight years in Japan leading a troubled company to become the biggest Asia-based regional asset management firm, McCarthy, a California native, is living back in the U.S. and gearing up to promote his forthcoming book, “The Safe Investor: How to Make Your Money Grow in a Volatile Global Economy” (Palgrave Macmillan-Feb. 4, 2014). As chairman and CEO of Nikko Asset Management in Tokyo, he was the first American to run a Japanese money manager, tripling Nikko’s AUM from $50 billion to more than $150 billion largely through his World Series funds program and buying up regional firms. He came to Nikko after overhauling and transforming a troubled South Korea investment bank into an enormous success. Right before that, he started Schwab’s winning OneSource mutual fund trading program and made the discounter the go-to place for online investing. McCarthy came to Schwab after a two-year stint in Hong Kong as CEO of the Jardine Fleming Unit Trust, following seven years as president of both the Fidelity Investment Advisor Group and its National Financial Institutional Services, where he launched a fund platform for banks and independent brokers. Having left Nikko in 2012, the Harvard MBA is now lending his expertise as a consultant to small Silicon Valley startup companies. You’ve earned a reputation for cleaning up messes and turning companies around. You must be one tough manager. You’ve got to be pretty strong sometimes to get people to do what you want. One reporter said I had a Maoist management style: Go three or four ranks down and make those people in charge because the guys one or two ranks down won’t do it. There’s a lot of truth to that. Are you a bit of a hatchet man? Oh, yes. Once you move people out, it sends a signal that this is for real: if they don’t do the job, they’ll be out of one. The Japanese attitude is that it’s lifetime employment. The Western idea is: You line them up and have a big layoff day. But rather than cutting off heads at Nikko, I found people jobs so they wouldn’t be embarrassed. In your book, you mention that in the mid-’90s, you did a considerable amount of trading with Bernie Madoff and Peter Madoff’s company. How was that experience? Well, they were traders – any time you’re talking to a trader, you want to hang onto your wallet! Do you now know if Bernie Madoff was committing crimes against his clients at that time? The evidence is coming out. When he first started his fund, you could make a profit on the spread, and it was legitimate. But in the mid-’90s, those big, easy-money spread opportunities went away, and the game ended. An honest businessman says, “Okay, guys, thanks for giving me the money. I made a lot for you. It’s been great, but it no longer works. So I’m returning the money.” Bernie didn’t say “game over” and hand back the money. Is that when he started stealing from his clients? My first inkling that something was up was in 2006, when we had calls from Japanese institutions to bring in the Madoff fund. But when we went to do the due diligence, he wouldn’t answer a lot of the questions. We couldn’t get the information. We were really worried because we knew him, and yet it wasn’t adding up. I said, “Look, I don’t care if it’s my mother. If the guy isn’t answering questions and giving us the information we need, then we aren’t going to do business with him.” So we turned him down in Japan. He wouldn’t release the kind of information that any sophisticated investor would need in order to invest. And sure enough, in the last few years of his fund, there weren’t a lot of sophisticated institutions coming in anymore. And no one was reporting him to the regulators? I’ve not seen the data or evidence. In the early days, he attracted a lot of very sophisticated investors. It was smaller money. They would do the homework – the annual due diligence that you have to do on everybody. But after three or four years, they got comfortable: “We’ll do a cursory audit because he’s always been fine.” They got lulled into thinking that everything was OK. Also, the newer investors were a lot less sophisticated. There were very few moxie Wall Streeters that came into the fund in the last two or three years. You were the first foreign head of a Japanese financial firm, CEO of a major Japanese fund company and the first chairman of a major Korean investment bank. How did the Asians react to having a Caucasian boss? In Japan, the headlines read, “First Blue-Eyed.” I thought: “My eyes are hazel! I don’t know what they’re talking about!” But “blue-eyed” is slang for anybody that isn’t Korean or Japanese. It’s a little derogatory. It was quite a process for the governments and even the industry to make a decision to let a foreign group own a majority of a major financial services company and then on top of it, to have a CEO that wasn’t Korean or Japanese. So I had to be extra careful. That must have been a delicate situation for you. It was the most challenging part of working in Korea and Japan. When you show up at a troubled firm and there are 3,000 Koreans and then one white guy, and in Japan, 500 Japanese when I walked in the door and then me, it can be a bit intimidating. So it took a certain amount of emotional management. Before those jobs, you were with Charles Schwab. How was working with Mr. Schwab? What I learned from Chuck is that as CEO, you’ve got to decide what you need to focus on and make sure you hire others to take care of stuff that needs to be done right but that you don’t have to look at every day. What was one of the chief things he focused on? The customer experience manifesting itself in the brand. He once said to me, “Chuck wouldn’t do that!” What he meant was “Chuck” in the eyes of the investors: This is what he is, and this is what he ain’t — and we always have to be paying good attention. What did you learn from working with the chairman of Fidelity, Ned Johnson? It absolutely shocked me how much time he spent talking to and really understanding small investment advisors and retail investors. I could get an appointment with him to see a tiny investment advisor often on the same day’s notice. But if a CEO of [some big firm] came over, he wouldn’t be available. He really understood what motivated people at the grass-roots level. Anything else eye-opening that you picked up from these leaders? Though over the years, all the firms have gone after the high-net-worth-client — those with more than $5 million — two franchises that probably grabbed as much high-net-worth money were Charles Schwab and Fidelity. Yet both these head guys were trying to build a product for the man-in-the-street. If you do a good job for the average guy and one in 50 gets rich, he’ll stay. What was your mission when you joined Schwab? They didn’t know mutual funds, and they didn’t know what to do about the Internet. I was hired to fix the fund company and also make the decision about the Internet. We decided it was worth the risk to put all our accounts online. That sounds silly now, but at the time it was quite a difficult [call]. Why did you leave Schwab? By the end of 1998, its stock had just exploded. We were worth about $42 billion. But because I was president, I couldn’t sell any more than 5% of my stock unless I left the company. My equity position was all in options. So if the company fell half in value, I would be completely wiped out. I was very concerned about the market; in 1999, I left and sold my stock. Was there anything else motivating you to move on? [Investment bank] Hambrecht & Quist gave me a hundred-million-dollar line of capital to buy what I liked. But everything I looked at in the U.S. was very expensive, whereas in Asia things were opening up — they were allowing foreign firms to take over major companies for the first time. Though it looked risky to a lot of people, from my standpoint, the price of Ssangyong Investments & Securities, the fourth-largest investment bank in South Korea, was so reasonable — $65 million for a 52% stake — that it seemed a better opportunity than anything in the U.S. This was a company in distress. You renamed it Good Morning Securities and made it successful. Yes, three years later, that $65 million investment was worth over $400 million. I sold the company to the second-largest bank in Korea. I came back to America and figured I’d retire. But the people at Nikko said, “We have an asset management company, the third largest in Japan, that’s in trouble. You can take it over.” It was losing money. I brought in investors. Over the next eight years, we grew the AUM from $50 million to $150 billion. The programs that we put together worked. What approach did you use to turn Nikko around? It was a process of modifying the most minute details to make best practices work in another country. At the end of the day, it all comes back to local. You write that Japanese investors’ philosophy is to put all their eggs in one basket. While you were at Nikko, did any of them start diversifying? Things you learn in your culture when you’re very young are hard to fully break with. We did get some people to broaden, but oftentimes, they’d lapse back. I felt we were at least half-successful: Our average Japanese investor had more international diversification and more different types of countries than you see with American investors. What happened with Nikko’s planned IPO? The last time we wanted to do one we did a preliminary trip around the world to see if there was an appetite for it. But the public markets had fallen apart in 2011, and we got concerned about how weak they were. More importantly, Asian institutions would pay a lot more for the company than global retail would. So we decided to go that route and sold to Sumitomo Mitsui Trust and DBS Bank. I came in at $350 million and sold it for a billion-and-a-half. You write about investing in “frontier countries,” which you define as those that at one time “showed promise” but have been “unable to progress” — Argentina, for example. Is investing in frontier countries appropriate for individuals? If a country hasn’t made it, it’s hard to predict when they will. Twenty years can go by. That means if you’re age 25 or 35, owning a small basket of countries has a chance to get you really superior returns. But if you’re 65, maybe you don’t want to be down at the frontier level. You mention some frontier countries that look promising, like Egypt, Qatar and Vietnam. What’s appealing about Vietnam? The managers are so talented and hardworking. It’s going to be a very interesting place to invest. But now there aren’t that many stocks to buy where you can trust the accounting. However, Vietnam will get cleaned up. Every country has to go through many cycles of fraud and scandal and then come back out of it. When you look at an emerging or frontier country, ask: does it have a good chance in the next 10 years to be quite a successful place to invest? Speaking of fraud and scandal, let’s get back to Bernie Madoff. You write that he and his brother Peter had “great insights” about the industry. Such as what? Bernie did some things that made trading a lot more efficient, which flowed back to better execution for customers and lower fees. That’s one reason he was made chairman of the [National Association of Securities Dealers]. For instance, he bought the license for the Cincinnati Stock Exchange, opened an office in New York and did it all electronically — no brokers, no market makers, no specialists on the floor. There was no floor! This allowed him to have a registered entity that was an exchange, but it was very low-cost and gave a lot more visibility to orders. That was unheard of and revolutionary. It changed how trading was done and improved it. Did you have any personal experience with Madoff-brought efficiencies? When I was running Fidelity’s National Financial business for correspondents, a few of the very important ideas I got on how to match retail orders with institutional orders came from Peter and Bernie. It’s the ultimate irony that evil people can also do helpful and creative things and that people with good standing in society can do really evil things. Therefore, you always have to have your guard up. How would you change the industry to benefit financial advisors? Money manager Ken Fisher told me in an interview that he foresees RIAs becoming toast within 10 years if the fiduciary aspects of Dodd-Frank are implemented. Your thoughts? I don’t think that will destroy the industry because fee-only independent investment advisors are now respected for more than just the fiduciary obligation. The other thing is that major brokerages’ compliance departments are getting pretty strict. So brokers across the board aren’t much more lax compared to RIAs. I like the fiduciary law. But on the other hand, we’ve seen a lot of compliance departments move pretty close to it, anyway. You write about a personal “wealth signal” — an indicator to oneself that you’ve “made it.” What was yours? At Fidelity, I had a Honda Accord. My staff said, “We can’t have the boss picking up clients in a four-year-old Honda.” So I got a used Rolls-Royce. The car worked fine, but at the end of the second year, I said to my mechanic, “You know, Tom, I never knew the name of my Honda mechanic.” So I saw that sometimes things that cost more are actually more troublesome. My wealth signal was: Don’t let the money own you. Right now, I’m enjoying helping small Silicon Valley startup companies in health services and digital media grow. Silicon Valley is such a vibrant place with so much more to be done. Financial services is pretty mature. Does that mean you won’t return to the industry? I wouldn’t say never. I’ll see how I feel in six months. I’m enjoying working with these startups. The engineers may know technology, but they don’t understand customer service and how to put it all together. When you were a teen, you earned a black belt in karate; now you’re into golf. As a boy, you went hunting. Do you still hunt? Not in 40 years. Once I killed a black bear, skinned it and kept the claws. They stunk up the whole house. Bear-claw toe-jam does not work as potpourri!